Remember the old slogan, “whiter than white?” For years, laundry soap manufacturers have used a little trick to keep clothes looking white, and it has nothing to do with making them cleaner. 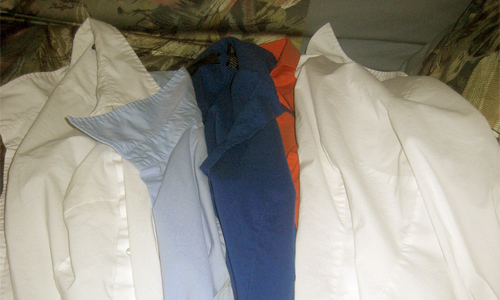 Lighter and white clothes in particular have a tendency to yellow as they age. Over time, it can leave the impression clothes aren’t clean. To get around this, manufacturers started adding a substance to the detergent called “Florescent Whitening Agents” (FWAs). A whole range of chemicals fall into this category — including such tongue twisters as tetra-sulfonated triazole-stilbenes. The first of these FWAs was discovered in 1929, which gives you some idea how long this has been going on. When embedded in clothes, FWAs trick our eyes into thinking the item is cleaner than it actually is. FWAs take ultra violet light — which the human eye can’t see — and reflect it back as blue light which is visible to the human eye. This process makes the fabric appear cleaner. Of course, these agents not only cover up yellowing, but dirt as well. But the move towards LED lighting is causing a problem, because LEDs do not send out ultra violet light, which in turn can’t activate the FWAs. Clothes that seem clean in one room, can appear dirty moments later in another depending on the light. Researchers at Penn State studied the impact LED lights have on the appearance of clothes. They had 39 people rank clothes with different levels of FWAs in them under regular lighting and then LED lighting. Under regular lighting, the clothes with more FWAs shone. However, under LED lighting, the clothes appeared as they really were. With increasing LED usage, some have even suggested adding ultra violet light to the LED spectrum, to allow the game to continue. In Isaiah 64:6, God says our righteousness (good works) looks like filthy garments to him. Because we have the very same problem in Christianity. We have a FWA that convinces us we are cleaner than we really are. Our conscience is our personal moral measure of right and wrong. When we do wrong, we feel bad, when we do right we feel better. In fact, our good activities can often trick our mind into nullifying bad behavior, because we have appeased our conscience. It also seems a few good acts can disproportionately take out a whole whack of sin. This may be why some people think they will go to heaven, because they have lived a good life. In the Roman Catholic church when a person confesses their sin, the priest often tells the person to do an act of penance — religious activity or good work. Now don’t get me wrong, sometimes what the priest requires makes sense — praying for people who have offended you. But often penance is little more than a religious exercise to appease our conscience — such as saying three “Hail Marys” or even doing a “good work.” Confessional has worked for hundreds of years, because there is an element to it that provides relief from guilt. Evangelical or Catholic, we all have used the FWAs or our own good works to appease our conscience. But the reality is we haven’t been cleansed from our sin. It is still very much there and in some ways like the laundry detergent trick, people believe they are cleaner than they really are. Maybe this is why the Bible says our righteousness appears as filthy rags to God. Our righteous or good acts are a FWA that fools us into thinking we are clean, but God sees us for who we really are. The only thing that cleanses us from our sin is the Blood of Jesus — confessing our sin and believing Jesus paid the price.